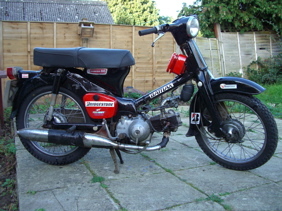 Honda C90, the perfect green laner! 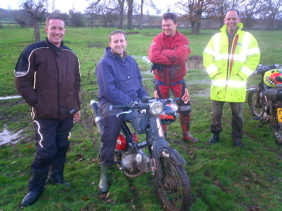 Green laning has been on the to-do list for years, we can't all afford motocrossers so made a pact to go with a Honda C90 each! 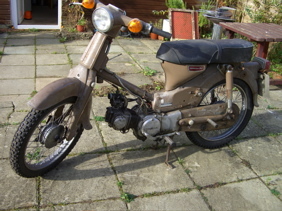 The next C90 is a ropey eBay purchase, it's had 1 repeat ONE owner from new and was last used in 1979! There's no danger of it ever running again but I'm a sucker for punishment! Lots more pictures and silliness to come! 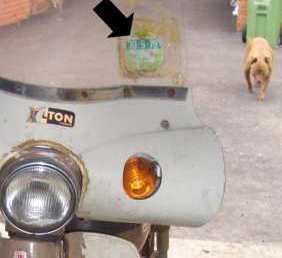 Clearly some work had been done on the engine with the re-assembly dealt with by a Donkey or animal of similar intellect! 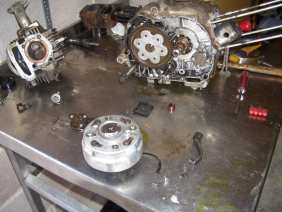 Any bolts still in place were finger tight at best, the rest had all made friends with the gear box/clutch/big ends etc. 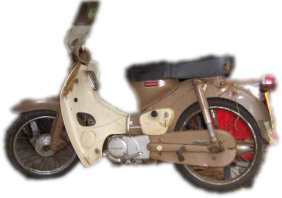 Here's the first pictures of one of the other C90 Cub peds, owned by a perfectionist who has already stripped, painted and re-chromed! Good god, they've been breeding!!! 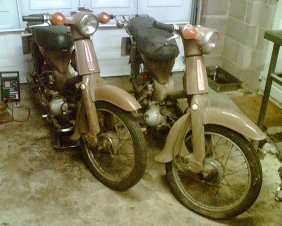 I now have two pooh coloured Honda C90 wrecks in the garage. 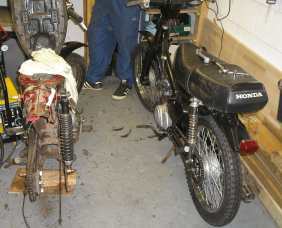 ..
A Honda C90 before and after! It's alive!!! 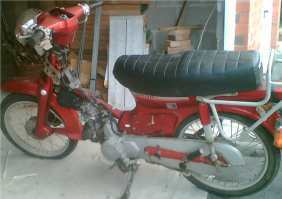 I've grafted both C90s together and now have a runner, albeit a smoky one. Having piston rings in a dozen pieces means that it expels more smoke from the various holes in the crankcase than from the exhaust! 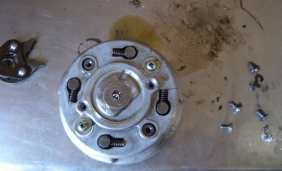 Clearly a sign from above that a big bore kit is required... Next step, nobblies! And here's proof that NOTHING is beyond Hammerite! 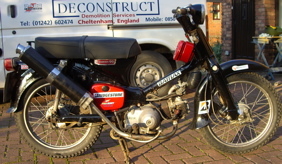 I know I know, an off road bike without a noisy exhaust??? 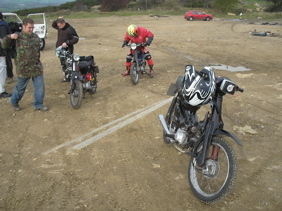 and, even sillier, the other bike has a megaphone!! 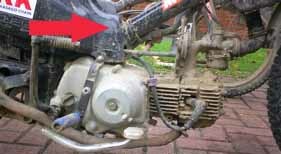 The 4x4 owners were laughing even more than we were, the only casualty was a bent gear change, the Honda C90 is truly indestructible! But the exhaust was tiny! 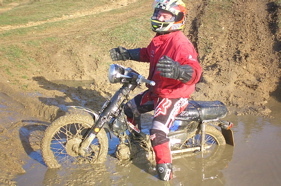 Another outing on the peds, shame they're not submersible! 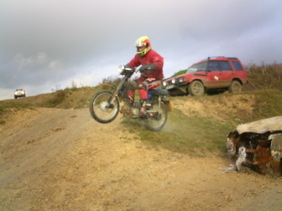 The Honda C90 might not be waterproof but it can certainly jump! and the ability of someone to capture the proof. Unfortunately, all this stupidity was only going to end in tears. 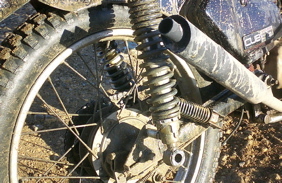 Dave managed to break BOTH of his rear shocks, other casualties included a flattened downpipe, two snapped exhaust studs , one gear change lever, a horn (??) and our of course our pride. 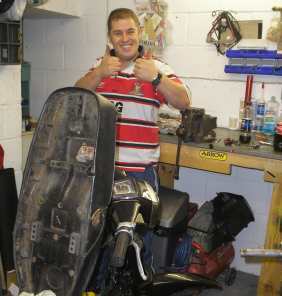 Evil Knievel even managed to bend his frame, it's not all bad, he's now the owner of a custom, low rider Honda C90 cub! Serve's em both right for buying the Cub 90 instead of the real thing, the only damage to mine was cosmetic, she's invincible! 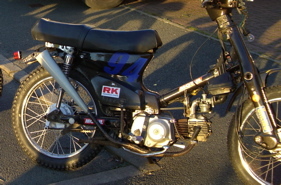 Time for the race tuning to get serious! 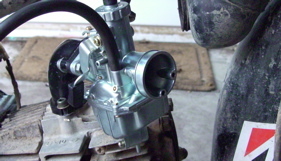 I've managed to blag myself a 26mm Mikuni with big bore manifold, way way too big for the motor but hey. Fitting it took my top speed from about 50mph to 25mph, not good! Adding a proper filter has given me an indicated top speed of 60 mph! We braced her at the same time and added a different fuel tank, I really didn't think that it could have looked any more stupid. We managed to kill one of the 90s on the way leaving just two bikes but that didn't stop the carnage. 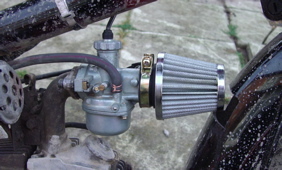 Mud cooling for the Honda C90, works a treat! We thrashed the peds for an entire afternoon without a single breakage only for the sump plug to fall out of mine on the way home. 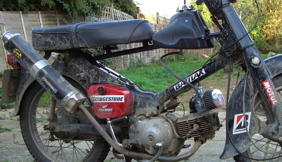 Only a C90 could manage the last mile of a journey without oil. 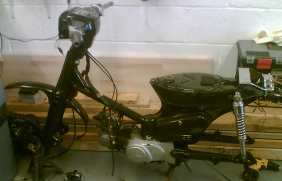 The best bit is that even though she seized solid, I know that a bit of fresh oil and she'll be as good as new!